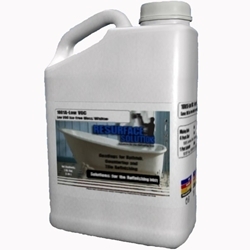 1001 HS VOC Compliant ISO Free Tub White gloss coat is a two component isocyanate free, fast drying coating, containing premium grade acrylic polymer. 1001 HS has the quality of a superior coating, low V.O.C. as well as excellent flow, dust dry time, color retention, and abrasion resistance. See 1014-LV Catlayst below in Related Items.